Background screening compliance starts with the Consent Form. Ignoring this important requirement can be the difference between hefty federal fines and expensive civil litigation costs. Here you’ll find a useful guide for Consent Form Compliance. Before we get started, please note that Choice Screening cannot act as an attorney and cannot provide legal advice. Use the below information to consider how you use the Consent Form in your background screening policy and identify any red flags for non-compliance. Contact Choice Screening with questions you may have – we will answer what we can! Before you begin a background check, obtain a signed Consent Form from your applicant. According to the Fair Credit Reporting Act (FCRA) § 604 – 15 U.S.C. § 1681b, employers are required to provide applicants with a consent form that states, in writing, a clear and conspicuous disclosure that a consumer report may be obtained for employment purposes. Additionally, the document must consist solely of the disclosure as a stand-alone document. The applicant then signs the consent form, authorizing an employer to procure a report. 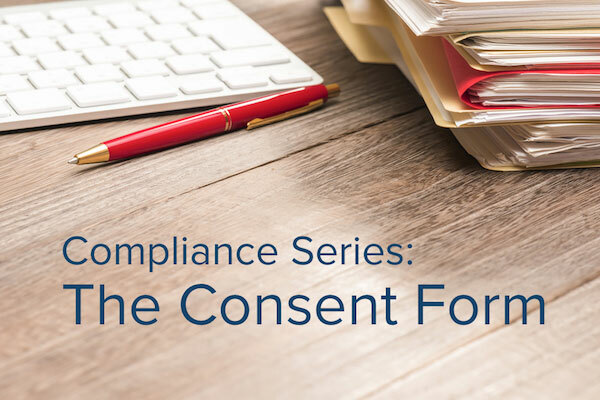 Be sure your Consent Form has been reviewed by your attorney or internal personnel for compliance to the FCRA, local legislation and additional requirements. The Consent Form is a few pieces of paper that could save or cost your organization thousands, if not millions. Before using any Consent Form, we recommend having the form reviewed by an experienced attorney or qualified internal personnel. This will help identify areas of concern, like erroneous information, that could violate the FCRA or other laws. A recent (and reoccurring) example of this is a release of liability as was the case in the $6.8 Million settlement with Publix grocery chain. An attorney review may also identify additional requirements, such as the New York Correction Law Article 23-A. Although this disclosure is required for New York applicants, it must be kept separate from the FCRA-required disclosures. You’ll also need to determine when you can provide the consent form and what information you can request based on Ban-the-Box, Fair Chance, and similar legislation as well as your exemption from such laws. A lot to take in? That’s only part of it so make sure you’re getting qualified advice. Choice Screening provides a FCRA-compliant Consent Form, free of charge to our clients. Our form has general-use purposes, adheres to federal regulation and is maintained by our Compliance Manager. It helps employers remain efficient by having the applicant enter their own information and pre-populates this information when the report is initiated. The consent form is then readily available to our research team and kept with the background report results for you! However, limitations do exist. As mentioned, certain jurisdictions may have additional requirements that need to be provided to the applicant. No matter the company, a Consumer Reporting Agency (CRA) supplied Consent Form cannot cover every single law throughout the US. In doing so, it would inadvertently make employers vulnerable to violations, for example including erroneous information from California to applicants outside California, or making applicants receive NY Article 23-A when it’s not required. Local laws that impact how a background check can be run date back for years. Recently, Ban-the-Box legislation has been steadily expanding throughout the US including proposals into federal law. Other common legislation includes Fair Chance Acts and laws that impact, typically limiting, the use of credit reports. Among other requirements, this legislation occasionally includes the Consent Form and could impact when it can be provided and what information it contains, namely the check box for the applicant to disclose a criminal past. Some exemptions exist, such as federal employee or law enforcement, or financial institutions for credit report restrictions. It’s easier to keep up if you subscribe to industry blogs such as Choice Screening and your local SHRM chapter. This will help you identify trends that could impact you and supplement your other sources. A compliant Consent Form can only go so far without proper use. Consistent use of your Consent Form for all applicants and employees that adheres to federal as well as local law is vitally important. Similar to the content of your Consent Form, your employment attorney or qualified personnel should review your Background Screening policy for adherence to law. Also consider if the information is clearly and appropriately communicated to those facilitating a Consent Form and those who are the subject. Lastly, lackluster training can be your worst enemy, so make sure it sufficiently covers all your compliance standards and continues on as legislation changes. Consent forms are evergreen, meaning as long as you have a consent, you can use this to conduct a lawful background check through the course of employment. In other words, if you intend to run annual background checks or a background check when an employee is up for promotion you do not need to obtain a new consent form. It’s a good idea to openly communicate your Background Screening Policy for Ongoing Employment with your employees, such as annual background screening and policies related to promotions and transfers. In doing so, employees are aware of the conditions under which a background screen could be run and will have clear expectations. You may have noticed that the above could be split into two themes: Content and Application. Each serve important roles and both are necessary to adhere to the FCRA and local laws. The third leg, that keeps everything from falling over would be an attorney and qualified internal personnel. Make sure you pay sufficient attention to all three legs and you’ll be pretty stable! What unique requirements, based on local laws or industry requirements, does your company adhere to regarding your Consent Form? Tell us your comments below! Do you have more questions about Consent Form compliance?